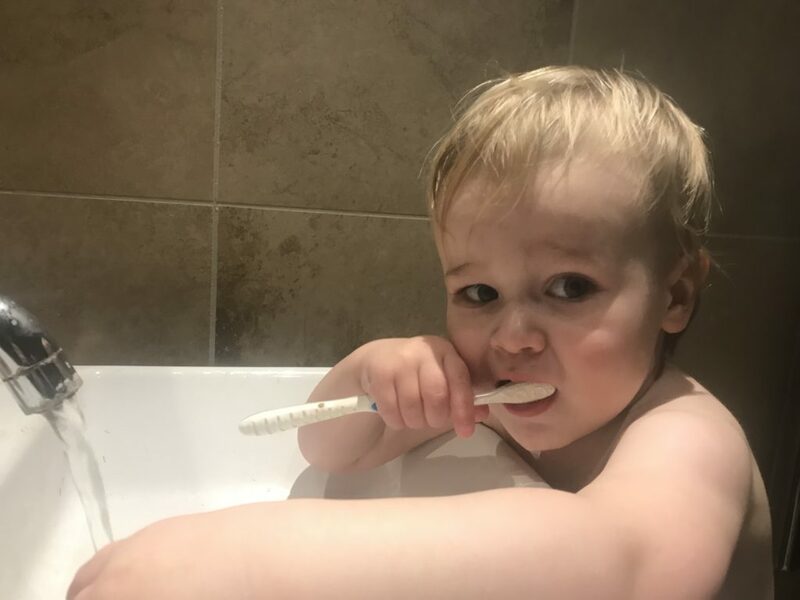 Brushing your teeth isn’t the most glamorous of jobs and trying to get your strong willed toddler to do his teeth every morning and night can be the biggest struggle ever. Talk about battle of the wills, We’ve had tantrums, tears, screaming and plenty of hitting out, but finally I have found a way that works for us that means I can finally stop being paranoid that he will lose all of his teeth before he turns two. Dexter’s first tooth popped through at six months old, prior to this I hadn’t brushed his gums, although there are products out there that can safely and softly clean baby’s gums if you wish to start them early. After his first popped through, the rest quickly followed and by the time he turned one he had most of his front teeth and a couple of molars too. At this point I was letting him hold a toothbrush while he was lying on his back and I tried to prod another toothbrush into his mouth to scrub what I could see. I was mostly met with a clamped shut mouth and a wriggly baby who just wanted to get away. Most days it was a battle; I tried doing it with him on my lap in front of a mirror, sitting on the toilet, sitting on a comfy chair with a book and letting him simply chew on it, thinking that was better than nothing at all. I then found a kiddy’s electric toothbrush which I brought home from Morrison’s one day and our lives changed over night. He loved the buzzing sensation it made and would put it in his mouth with glee. He loved it that much that it would be on for hours at a time and we went through god knows how many batteries. We were starting to make progress, but I still needed something else to perfect the routine. After an evening trip to Ikea, we came home with a small stool that I’d purchased so he could stand in the kitchen with me and watch me cook. I soon realised it could also be used in the bathroom and gave him access to the sink. Previously, we had been brushing his teeth in his bedroom; getting the toothbrush ready along with his clothes before getting him out of the cot of a morning. Now, we realised, we could get him up, take him to the bathroom, let him stand on his stool and let him see us prepare the toothbrush, turn on the taps and also watch us brush our teeth too. Some days we still have battles and I resort to some of the other methods I’ve listed below. 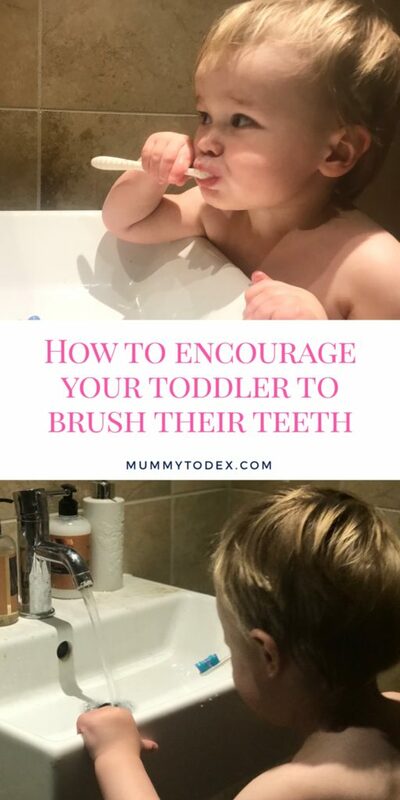 If you too are struggling to get your toddler to let you brush their teeth, hopefully one of the ideas below will help you. Dental hygiene is so important and I think it’s so scary the number of children that are having to have their baby teeth removed now as such a young age. Although Dex has never had milk from a bottle in his cot and he has never had juice, he does eat a lot of fruit which contains a lot of sugar so I do worry about cavities and plaque. Start early, even if they don’t have any teeth. It’s going to be easier if they are used to it earlier than starting when they are into proper toddlerhood. Invest in lots of different types of toothbrushes. Dex likes to pick and choose which toothbrush he uses. I usually find that we avoid a lot of tantrums by giving as our toddler as much autonomy as is safely possible. Some people call that passive parenting, I like to think that we are teaching our toddler to make well informed choices and to grow up to be kind. Let your toddler see you doing it. We all know babies and toddlers love copying Mum and Dad, so make sure you brush while they brush so they can see exactly how to do it. It doesn’t take many times of you doing it for them to pick it up. In his life, Dexter must have seen me put my contact lenses in a dozen times, if that. Yet if he sees an open contact lens case he will mimic putting an imaginary lens in his eye. Incredible. Talk to them as you are doing theirs and let them know what you’re doing. You could make a game out of it by pretending you are brushing away certain foods they have eaten during the day or that their favourite animals are living in the mouths and you are brushing those away. 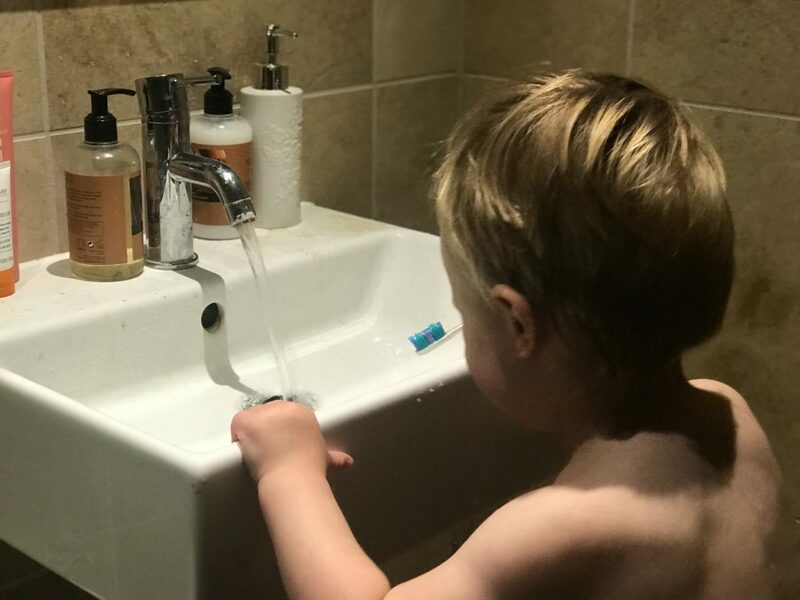 Invest in a stool so your toddler can stand up at the sink alongside you and feel like a grown up. Get a toothpaste that isn’t ‘spicy’. There’s even an apple flavoured one out there. If you have a range of different toothpastes then your toddler can choose which one they wish to use that day alongside their favourite brush. Find a song online about brushing your teeth, learn the words and sing it everytime it’s time to brush teeth. You could even play the song through your phone the first few times while you are learning the song. Dance around and make it really interactive. Distract them. If they really are getting upset when you need to brush their teeth, do it front of their favourite TV show so they don’t get so stressed. Keep to a regular tooth brushing routine. Make sure you do it at the same time everyday so your toddler knows it is coming. We like to do it straight after the bath in the morning and last thing before bed at night. Avoid holding them down or making a big deal of it. Sometimes this is unavoidable because dental hygiene really must come first, but using one of the methods above should help avoid this. How do you get your toddler to brush their teeth?